New, upgraded light kit based on the restored studio model lighting. This utilizes LEDs to simulate the rotating nacelle effect. This unit includes lighting for Navigation, Strobe, Impulse and Shuttle bay. Use this with the Large Spaceship Light kit from Paragrafix for a complete lighting solution. NOTE: Some experience with electronics is recommended. Some soldering is needed, but most of the components are preassembled. NOTE: This does not include the Large Starship interior lights sold separately. These units include fully detailed and illustrated instructions. 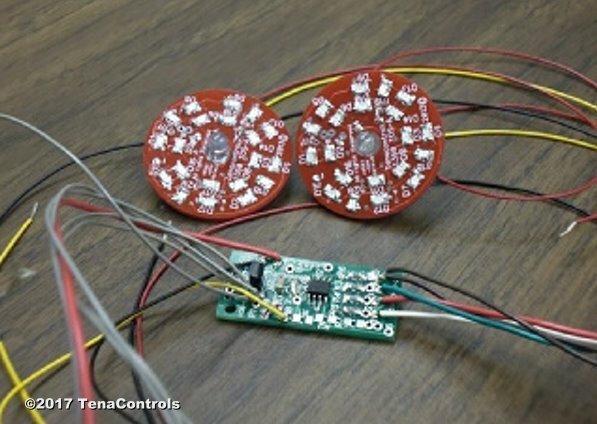 The video below shows the Tenacontrol circuits installed.